Mold finish polishing, metal sample piece polishing, paintwork finish polishing, work of woodwork, glass car repair, metal material groundwork polishing rust removing. 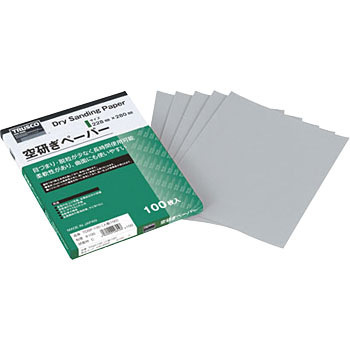 TRUSCO's sky-polishing paper is suitable for polishing curved surfaces and details, as the mount is thin and pliable. This review is about item#89617507. I was surprised to open it! Obviously the particles are finer than the things of Sankyo Rikaku used to date and those sold at home centers etc. (Usage is small?) So do not go down. About # 220 other manufacturers? The mount is too soft and there is no waist, I am hard to use. Although # 180 was also purchased at the same time, it looks finer than other makers. A word of disappointment. This review is about item#89617385. It is convenient because the number is set finely.